If the new year has you considering new goals, a trip to the Last Frontier could be the best way to fulfill New Year’s resolutions. Are you hoping to “unplug” more in 2016 or spend more time with friends and family? Perhaps relaxation tops the list of resolutions. Alaska offers a variety of unique and exciting activities that allow you to escape the ordinary and find creative opportunities to maintain your goals this year. Through the winter, there are plenty of opportunities to get outside. If you’re visiting Anchorage, take a short drive outside of the city to check out the Eagle River Nature Center, tucked away within Chugach State Park. The drive alone offers incredible, year-round views of glacial-carved mountains. Inside the center, learn about Alaska wildlife and history. Outside, explore the handful of groomed trails on foot or on skis. The trails cater to a wide range of adventure-seekers, from a quarter-mile nature loop to longer hikes into the backcountry. If you’re venturing out in the cold, wintry weather, be sure to dress appropriately—snow boots, a thick coat and layers of warm clothing underneath. While a family vacation to Alaska means more time with loved ones, look for activities that keep you busy together, learning new things and experiencing new places. There are a number of opportunities in the city of Fairbanks; the natural Chena Hot Springs and neighboring Aurora Ice Museum are sure to amaze. Fairbanks, known as the world capital of ice art, also hosts the World Ice Art Championships in early spring, bringing together the world’s best ice sculptors who carve out masterpieces for locals and guests to marvel at. 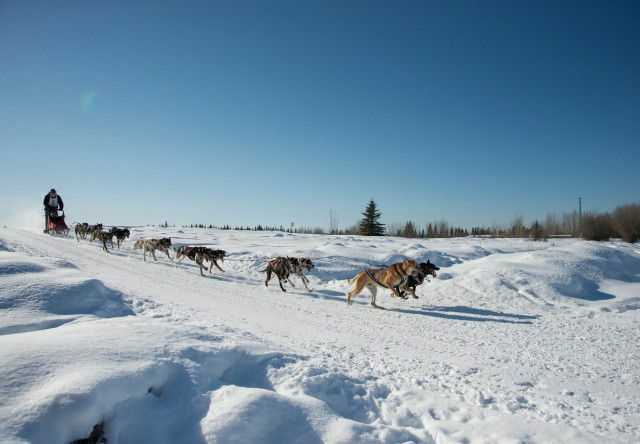 Time your trip to Fairbanks right and you can also get a front-row seat to the annual Yukon Quest Sled Dog Race, a 1,000-mile trail between Fairbanks, Alaska, and Whitehorse, Yukon. The race occurs in February every year, with mushers and their dog teams traveling the historic Gold Rush and Mail Delivery routes. Learn more about the official state sport and its deep ties to Alaska with a visit to Bouchard’s International Dog Mushing Museum. If you’re tired of being a spectator, go for a ride yourself during an educational and interactive mushing tour that just might turn into a new hobby. The Southeast town of Sitka, Alaska, is the perfect getaway if relaxation is a priority. Sitka offers a combination of nature, culture and history in a quaint, seaside setting. Walk the shops downtown, learn about the Tlingit and Russian cultures that are deeply rooted in the region, or warm up inside while sipping on locally roasted coffee. Sitka is also home to Yoga Union, a nonprofit that aims to make yoga accessible to anyone. Drop in for a yoga session that is sure to leave you feeling relaxed and renewed. Giving back is a goal that often makes the list of New Year’s resolutions. Since carving out extra time can be a challenge, why not spend some vacation time by volunteering? There are plenty of community service opportunities in Anchorage, regardless of whether you are an official community resident! The Anchorage Pioneer Home, an assisted living facility for seniors, has a vibrant volunteer and activities program. Contact the Pioneer Home to coordinate a time to drop in and mingle with local seniors. There’s a good chance you’ll learn more about Anchorage from its longtime residents and leave with a few new friendships.